Liquid ring vacuum pumps continue to provide the optimum solution for many rough vacuum applications in the chemical and allied process industries. 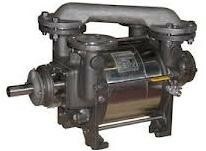 The general reliability, low maintenance requirements, low vibration and noise levels coupled with the unique capabilities when handling wet gases all contribute to the popularity of the pump. The SHR Series covers capacities from 500 to 5000 m3h with suction pressures down to 30 mbar A. The pump design incorporates many of the requirements of API 681 as standard and can be modified to meet customer specific specifications. Specialized seal arrangements, design pressures, inspection procedures, documentation and quality assurance needs can be accommodated. Generally these models will form an integral part of a fully engineered process vacuum system. We have considerable experience in the supply of highly specified, individually designed skid mounted packages that incorporate liquid ring pumps. Such packages are widely used in oil and petrochemical refineries and in the production of fine chemicals and pharmaceuticals. Each package is individually designed to fully comply with relevant project specifications and national design codes. We are able to offer full performance and functional testing and, if required, optimize manufacture in locations to suit project financing and or local procurement requirements.